Positives: Ponder has solid size, above average arm strength and good accuracy. He has impressive mobility and very impressive short area quickness for a quarterback. He is an intelligent player, he is very competitive and he has shown the ability to win games for his team late (most notably the UNC comeback his Junior year). He has played hurt and he regularly takes hits to deliver throws which speaks to his toughness. Ponder might not have a rocket for an arm, but he has good zip on throws that are within ten or fifteen yards of the line of scrimmage. He displays a good sense of timing routes and he knows when the ball has to come out and makes routine throws easily. He has good accuracy and places the ball well within fifteen yards very easily. He flashes the ability to throw well on the run and can obviously pick up good yardage with his legs. He also extends plays well and flashes pocket poise to step up and avoid the rush in the pocket. He also flashes the ability to hold defenders with his eyes and with pump fakes which I like to see. He will occasionally throw his man open and isn’t afraid to throw the ball into tight windows because he is accurate enough to do so. He also has a good feel for where he should place the ball and won’t lead his receivers into big hits over the middle, rather he will slow them down with a throw away from the defender. Negatives: The most critical thing with Ponder is his injury history. He suffered a shoulder injury at the end of his junior season and he dealt with elbow injuries throughout his senior season as well as a mild concussion that knocked him out of a game. He actually tried to play through the concussion but was pulled after it was obvious something was wrong on the next play. Ponder regressed a bit this season and at times was careless with the ball, his arm strength and zip on his passes was not the same as it was the previous season and he didn’t seem like the same player he was the previous year. He also seemed more willing to drop his eyes and scramble rather than step up, buy time and keep his eyes downfield at times and that worries me. He also didn’t seem to have a good feel for when he should step up because there were a number of times where he just stood where he finished his drop and ended up getting sacked and occasionally fumbling because he didn’t feel the rush and step up in the pocket to buy himself more time. Even when his arm is 100% Ponder doesn’t throw a very good deep ball. The throws have a lot of air under them and they aren’t often placed well. He does well when he can throw the ball deep without safety help over the top because he can just float the ball down the field and let his receiver run under it but have no safety help over the top is not an overwhelmingly frequent occurrence in the NFL and even when he floats the ball he can’t throw it more than 45 or 50 yards downfield. At times he will get flustered by pressure in his face and it will hurt his throws but other times he will throw fine in the face of pressure, so that inconsistency is a little hard to get a handle on. He also tends to stare down receivers a lot, which can be a problem. I think he can learn to not do this as much, especially since he flashes the ability to use his eyes well, but it’s a pretty big concern since he really telegraphed some throws with his eyes this year. Overall: When it comes down to grading Ponder it comes down to his injuries. If Ponder’s shoulder and elbow get back to 100% after the injuries then he can be a quality quarterback in the NFL. He won’t ever be a Pro-Bowler in my opinion but he can be an effective starter that, if surrounded by a quality supporting cast, can win his team a Superbowl. However, if his arm strength and zip on his throws is never the same then he will be more of a marginal starter and probably a career back-up and spot-starter. I tend to believe that his arm strength and zip on his passes will be better in the future than it was this season given his elbow problems that he played through, so I think his arm strength will be better than it was at times this year. I also think the injury hurt his accuracy at times this year, so I think some of his junior tape is more indicative of what he can do as far as zip on his throws and how accurate he can be. However, Ponder is a risk because of his injury history and there is no guarantee he will get back to what he once was. However, he has above average arm strength, good accuracy, impressive mobility and he is smart even if he made some bad decisions this year. 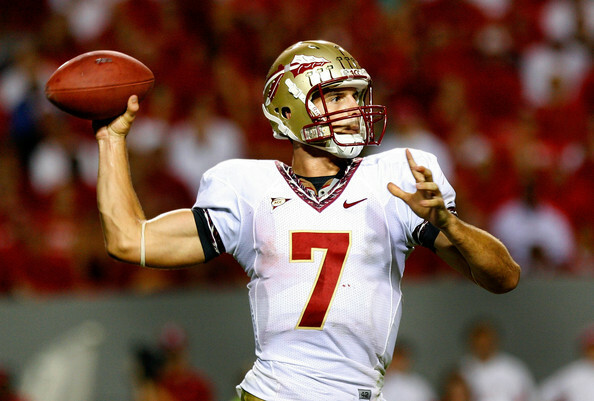 He will get the most of his ability and he was in complete command of the Florida State offense, so he shouldn’t have any problems with a NFL playbook especially since he has experience dropping back from center and making reads from under center. I think Ponder will be a quality quarterback in the NFL if he can stay healthy, but if he can’t (especially if he re-injures his shoulder or elbow again) then he will be a career back-up that isn’t worth a pick in the first four or five rounds. Projection: 2nd round. I think Ponder is one of the better quarterbacks in this class. He could slip until the late 2nd round because Gabbert, Newton, Locker and Mallett all figure to go before him, but if you are a team in the 2nd round that needs a quarterback (Minnesota comes to mind) then Ponder could be your guy. He won’t turn water into wine as a QB like Favre did at times but he won’t make as many mistakes either. Thanks for reading! Dareus is still on the way, and expect reports on Stanzi, Kaepernick, Devlin and Enderle soon!